It has long been held that summer is dead in real estate and things pick up in the fall…but is it really true? We hear this all the time from sellers, home owners and even other Realtors who seem to think that there are two “prime” or “peak” seasons in Ottawa real estate: spring and fall. We hear statements like "everyone is on vacation” or “gone to the cottage” etc. thus explaining why real estate “dies” off in the summer and somehow is magically reborn and “things pick up after Labour Day”. While it is true that summer sales decrease compared to the peak season in May and June, July and August are the next best sales months the market will see until the following April, so serious buyers and sellers should not put their real estate plans “on hold” until the purported "2nd season" in the Fall. Sales in July and August are some 20-25% less than those in April-May and June but are still usually well ahead of sales in September and October which are a further 10-20% lower, followed by November when sales start to go in to the winter hibernation phase of Ottawa real estate. New Listings and total listing inventory are also typically higher in the summer months than in the fall and winter, so it is a great time to be buying also. After a busy spring season, some Realtors may be looking for a bit of a break themselves, which is hard to do when one has to be “on call” and readily available close by to support a new listing or buyer client. So if a buyer or seller plans can be deferred a couple of weeks, the Realtor can sneak in some summer vacation time for themselves. Some Realtors may possibly be trying to save or defer some business activity until Fall, in an attempt to spread out demand (via listing supply) in what is a pretty strong seasonal business. Also, some Realtors may feel that for whatever reason, a certain property may get more attention in the fall or they may simply be trying to save some business activity to anchor the balance of their business year, especially with the typically slow winter season approaching from mid-November on. There may be some valid reasons in terms of market circumstances, competitive listing inventory, seller vacations, property preparation for listing and so forth but let us be perfectly clear: don’t delay listing your property in July or August because you think business is stronger later! 2 experienced brokers working for you…11th year in business! When is the best time to list my Ottawa property? When is the best time to list my house in Ottawa? Here is a graph we have compiled from monthly Ottawa real estate board published unit sales results (residential and condo property unit sales/month) for the last 5 or 6 years. This demonstrates a pretty consistent annual pattern in the Ottawa market. April through June are typically our peak sales months and this will come as no surprise for most. Government employees are relocating and families looking for a summer closing and move before the next school year, give this season a major boost. Each year Ottawa real estate handles some 800-1000 moves in to town by government personnel with an equal number moving away from Ottawa. The highest % of these are military and RCMP relocations. There is a significant myth that “real estate is dead in summer” and this table shows this is totally incorrect! July and August are typically the 4th and 5th busiest sales months of the year, so those who “wait until the market picks up in the Fall” are really doing themselves a disservice. These are “shoulder” or transition sales months. March activity is increasing for the busy spring and September and October are marked by erosion of peak demand heading in to the slower fall and winter season. Ottawa sales take a breather, as fewer people want to move during the winter time and seasonal vacations, holiday activity and weather all play a role in making house buying not quite as active. A lot of planning and preparation for the peak season can be done during January and February, so still an active period-just not as many sales. What dictates selling or buying times is often based on a specific property being available and this then drives the sale of an existing home. Those with homes to sell will want to consider their buying and closing timelines in a way that optimizes selling an existing property if at all possible. For example, buying a new home that closes in February means one is selling an existing property in late fall in order to co-ordinate the new home purchase. This however, is not the best-selling market for the existing property-so the seller will have to take this in to account when doing their pricing and listing plans. When will my property show best? Most properties will not show their best until mid-May when leaves are on the trees and everything has “greened up”, so some may wish to time their listing (and photo) plans accordingly. For example, a house with a pool will look much more inviting when the pool is open and warmer temperatures occur. Is my property ready to list? It can take longer than one thinks to get a property in HGTV condition for listing and selling, so this must be planned in to the listing cycle. The quality and number of head to head competitors to the property being sold (both new and resale) also factors in to the timing decision. How long will it take my property to sell? Sellers will have to factor in both selling and closing time in to the planning timeline and these can vary widely by location, price point and property type. There are a lot of variables to be considering in the listing, marketing and selling process and your Realtor is best equipped to help facilitate the process and optimize results based on all these factors. If one is planning a purchase or sale this year, January and February are the ideal months to sit down and have a planning discussion with your Realtor and any other key 3rd parties ie mortgage broker, stager, trades people. If you are not already working with another Realtor, we are happy to provide a no cost, no obligation market evaluation of your property to help you with your real estate objectives. 1. Remember: buyers shop online first, so make sure your house and property are 100% ready for listing and that you get the best photos possible. A professional real estate photographer is recommended. 2. Curb appeal counts! How does your property look from the street? What could be done to make it more appealing? 3. Lawns, gardens and trees should be well maintained and be an attractive accent not an eyesore. Buyers will assume the whole home is poorly maintained if the exterior property has not been looked after. Hire a lawn service, gardener or landscaping company if necessary. Replace any dead, damaged or diseased plants, limbs or branches. Fertilize lawn in early spring and again late spring. Cut grass at least once weekly. Though costly, don't be afraid to water your lawn if Mother Nature does not! 4. Paint, stain and caulking: decks, fences, trim, garden sheds and caulking should be reviewed and updated where necessary. 5. Stage your outdoor space front and rear! Replace faded furniture or cushions or buy new furniture to highlight your best outdoor spaces. Key features like decks, patios and verandahs should get special attention and investment if required. 6. Check roof shingles, flashing and eaves trough. Clean and repair as required. 8. Organize your garden shed and garage so buyers can see there is lots of room for their “stuff”. 9. Make sure garbage cans or composting does not produce any odour. 10. Indoor temperature at 21-23 C. (70-75F) One wants visitors to know the AC works well but don’t make it too cold or contrasting with the outside temperature. 11. Basement dehumidifier may be required as dampness and poor air circulation can produce a stale even musty odour in basements during this humid time of the year. Portable fans may also help or one can run the furnace fan if it is not too noisy. If you have them, make sure your HRV (heat recovery ventilator) and your furnace humidifier are turned off, so you are not allowing additional moisture and humidity in the home. 12. Check window wells for drainage and remove any clutter or debris. 13. Clean all windows inside and out or have a professional company do it. 14. Check for unwanted wildlife, insects or pests and take remedial action i.e. remove wasp or yellow jacket nest. 15. Make sure all pet damage or droppings are attended to. 16. Remove any surplus or extraneous material that may be cluttering any portion of outdoor space. When in doubt…move it out! 17. check your front door and surrounding area to make sure it is clean, well maintained and dust and debris free-this is the entry to the property and reflects the care taken with the whole property in the eyes of buyers. 18) encourage friendly neighbours to keep up their yard work and property maintenance-after all; what you sell your property for will have an impact on what they sell theirs for in future! Think summer is "dead" in Ottawa real estate? ...think again! There are many myths around real estate and one we hear quite often concerns summer being a “slow time” in Ottawa real estate: “schools out and everyone goes on vacation or to the cottage…” or “…the weather is too nice/summer is too short and everyone is enjoying outdoor activities and festivals” and so on. We have had many customers over the years thinking they should defer listing their properties “until things pick up in the Fall/after Labour Day”…..big mistake! April, May and June are the peak season for Ottawa real estate in terms of unit sales, as well as the number of listings. Both unit sales and new listings have started to ease off somewhat now that we are at the end of June but summer is still a hugely important time in the real estate year. Serious buyers and sellers are very active in the market and in fact, may be under some pressure to make a purchase &/or selling deal if they have not been successful during peak season. July is likely the biggest unit sales month until next April! Based on unit monthly sales over the last several years, our sales in the month of July will not be exceeded until April 2017…so bottom line: there is no better time to be selling before next spring than right now! July is the 4th biggest sales month in terms of unit volume and August is 5th....so don't "wait for the fall market"
While it is true that unit sales drop 20-25% in the 3rd quarter vs the 2nd quarter, it is still much, much better than the 4th quarter where sales drop 45-50% in terms of units sold. Ottawa sellers: don't miss out on inbound military and other buyers! We are on the cusp of the busiest few weeks in Ottawa real estate as March draws to a close. With the new Federal budget year starting April 1st, comes the beginning of prime government “moving season” which sees a large number of military and RCMP personnel relocations happening between April and August. Up to 1,000 moves in to Ottawa and the same number move out annually, many of these originate in April and May. Those relocating on the Integrated Relocation Plan (IRP), typically must sell their existing property (with a firm agreement of Purchase and Sale) at point of origin before making their house hunting trip to Ottawa. Those moving to Ottawa would typically be seeking July or August closing dates to facilitate school registration. When relocating employees visit Ottawa for their formal house hunting trip, they have a very truncated period to make a purchase decision, normally a week or so. This puts a lot of pressure on the family moving and their real estate team, particularly if the family is not familiar with Ottawa. What often happens is that these buyers try to cram as many house visits as possible in to their first few days (15-20 houses daily is not uncommon!) and then narrow their search down as quickly as possible. Trying to schedule and juggle timelines is a real job for the Realtor and also can be a mind boggling exercise for the buyer(s)! -their property is not listed on MLS®. Virtually 100% of these buyers will be represented by Realtors and it is typically much easier for a buyer to schedule a property showing for an MLS® listed property with Realtor and brokerage support. -they are not able to manage showings on short notice or be flexible in showing times/duration or other scheduling issues. -overpriced listings may miss key search parameter levels of incoming buyers and therefore not even get consideration from this important segment. -poorly maintained or presented properties or other unique properties will also have trouble as most of these buyers want “move-in-ready”. -they are not able to accommodate a buyer closing date, as this is probably tied to both their existing home sale and their report date here in Ottawa. -sellers who wait too long to adjust their plans or pricing may miss the wave. If you don’t sell your midrange property in 30 days or less at this time of year then something is wrong. Talk to your Realtor and take some definitive action! If you know anyone moving in our moving out of Ottawa this year, by all means please send them our way, if they are not already working with another Realtor! We can often also assist in finding a Realtor for them in their destination location. 1. meet with your Realtor to discuss plans and get an up to date market evaluation and check up on your existing property. 2. establish a well buffered estimate of baseline selling price for your existing property. This will help establish net equity in the existing property to apply towards purchase. 3. calculate all closing costs on selling existing property and purchase of new property. 4. estimate total costs of ownership for new property including; taxes, utilities, condo fees, maintenance and any other recurring costs ie rentals, leases, service contracts etc. 5. Meet with your mortgage broker or bank to review financial ramifications and build a plan. 6. book a home inspection now to check on all critical home systems and insure there are no hidden defects. Inspection may result in recommendation for additional expert review or service call. 7. invest in a professional Staging consultation to determine what might be done to show your property to its fullest potential and what this would entail financially. 8. keep a close eye on properties selling in your own neighbourhood, so you have an up to date feel for the market and at what price properties are listing and selling. Your Realtor can set this up for you. 9. Have an auto search set up for properties to purchase in your desired area, style and price range. Again your Realtor can set this up for you. 10. Review all items and recommendations coming out of the Realtor evaluation and Staging or inspections and determine which have the highest priority and how it will help marketability of the property. 11. Schedule key preparation activities well in advance, particularly those involving professional trades, as can often be difficult to find when the spring busy season comes around. 12. Start to depersonalize and declutter now and make plans for offsite storage, if required. 14. Get all inside preparation done during the fall or winter, so you can focus on any outdoor work once weather permits in the spring. 15. Visit existing property listings and open houses to get an idea of what is available in person, don’t simply rely on online analysis, as listings and photos may not tell the whole story or do the property justice. 16. Always keep asking: “…if I found my dream home tomorrow, how long would it take me to get my current property ready for sale? https://www.facebook.com/oasisrealtyottawa/ One of Ottawa’s top ranked facebook real estate pages…check it out! Summer is the best time to sell until next spring! One of the myths of Ottawa real estate is that summer is not a busy time for business. “…school’s out…everyone goes on vacation or goes to the cottage” are familiar comments to explain the perceived summer business doldrums. Nothing could be further from the truth! Real buyers and sellers are still focused on real estate as a top priority. For sellers summer represents the best chance to get their property sold and for buyers, they will have the best choice of listings until next spring. July sales levels are not typically achieved again until April and August sales are not superseded until next March, so now is the best time to get deals done. We have a lot of listing inventory available for buyer choice and some motivated sellers. Those selling, having missed the peak spring market are well advised to review their marketing and selling plans, particularly as regards pricing and presentation. Could mandatory home energy audits and a double land transfer tax be here for 2016? See post below on the potential for two potential provincial government programs that could really dampen our real estate market. Our market is steady but certainly not strong and we have far too much listing inventory. Either of these two programs will make selling (and buying!) more costly and if both were to be implemented, we would see a few months of high demand while buyers and sellers tried to beat program implementation, followed by an extended period of slackened demand which could dramatically hurt an already fragile and price sensitive market. A tougher market environment for most sellers continues in Ottawa, based on the large amount of excess listing inventory. While there appears to be reasonable activity and underlying demand, the inventory situation is making the resale market very competitive given the unbalanced supply/demand ratio. Good for buyers but not so good for many sellers. A key question many buyers and sellers ask is" "when is the best time to buy or sell?" 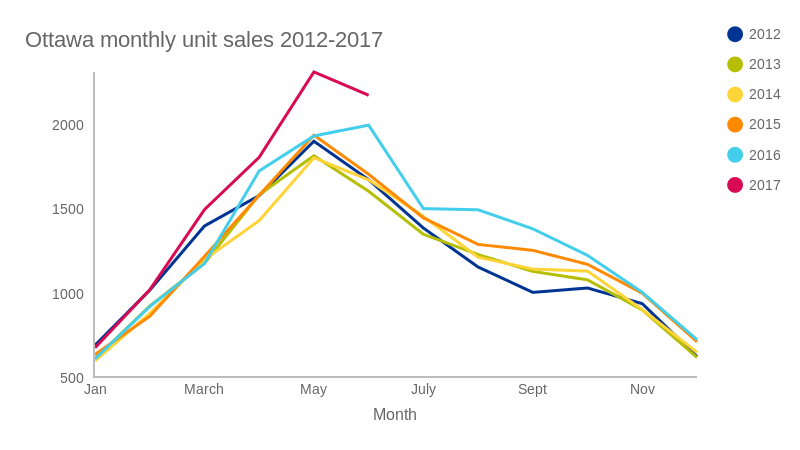 This is of course determined by individual buyer and seller circumstances but in looking at the unit sales history below, one can see how much stronger sales are in the peak spring and summer seasons. not intended to solicit those with existing representation agreements. Summer is a lovely time of year but unfortunately can raise some significant buyer issues which are real impediments to getting deals done. Though in most cases these issues are solvable, sellers should be cautious to review carefully the air quality and other issues in their basements at this more humid time of the year. The biggest issues are humidity and lack of air movement which can combine to form that damp smell many will identify as mould or mildew. Many buyers will think this is caused by either water penetration through basement walls, around windows or via back up-none of which is a happy thought for a buyer. We visit many homes that exhibit other odours which are exaggerated by the lack of air movement or excess humidity. Some odours can be related to pets, carpets which have been soiled or stained, cold cellars, athletic gear, teenager rooms etc. When owners live in a property every day, they are accustomed to the ambient smell and may not notice that odours are elevated to the point of turning a buyer off a property. 1) run furnace fan regularly to keep air moving. 4) use portable fans as a backup, if furnace fan alone does not do the trick. 6) check bathroom and floor drains to ensure water level prevents backflow of air and sewer smell or install backflow valve. 7) check around baseboard areas in spring or after heavy rainfall to ensure no leaks have occurred. 9) manage pet litter trays and basement access as much as possible. 10) rent industrial "air scrubbers" from restoration or air quality service providers in extreme cases. Make sure your basement is well lit and that the lights are on for buyer showings. The more “dungeon like” a basement appears, the less attractive its living space becomes. Do a thorough check to make sure you don’t have any visitors. Those older or country properties or who rarely even go down in their basement will want to be especially careful that there are no bugs or evidence of other critters having visited or taken up residence down there. Make sure the space is well organized in your utility room and that buyers and Realtors can have good access to furnaces, hot water tanks, HRV’s, electrical panels. Tags and maintenance stickers showing these have been regularly maintained and updated are a good sign for buyers. Summer is a great time to sell a home, in fact it is the 2nd best time after the peak months of April-June, so don’t forget the basement when it comes to having your listing really ready for buyers! Full service and lower commissions for sellers! Why do most buyer's want "move-in-ready?" Now the tables are turned and we have a buyer’s market in full force in our market. Our current market is characterized by excess listing inventory, very compelling and competitive offerings from our many fine builders and some price levels that have in many cases superseded the market’s ability to absorb them, particularly at the higher price points. (above $500K) Average days-on-market for the year 2014 was 78 days for residential properties and 89 days for condos and year to date this year (through Feb) we are running at over 100 days to sell. Will your recommended listing price generate an offer? How long should it take to get an offer and get the place sold? If it doesn’t sell in 30 days will you allow me to cancel my listing? If the property does not sell in 30 days, what is “Plan B” to get it sold? Do you have any training, conventions, travel, holidays or other personal commitments that will interrupt service during the listing period? What % of your listings have sold over the past year? 3 years? 5 years? Where and how often will my listing be advertised in paid media? How do you use paid social media advertising to highlight my listing? What are the marketing limitations of my property? What factors may mitigate against a successful sale? Do you use professional photographers to take pictures of my property for listing and promotional purposes? How will you keep us up to date on competitive listing activity in our area? How will you help me with staging? What innovative marketing programs do you offer that I cannot get from another Realtor? What is the protocol and process for showing appointments? Do you offer a variety of listing fee programs or is it “one-size-fits-all”? Do I get a discount if the listing salesperson/broker also represents the buyer? Do I get a discount if I also buy with the listing salesperson/broker? Hopefully, this checklist can help interview planning and make sure you get the information that is important for you to make an informed decision about what services are being offered and if it is a good fit. Experienced professional brokers with lower fees for sellers!